Caught in the crossfire! Frank Castle is caught in the crossfire in this plastic diorama statue from the Marvel Gallery line! 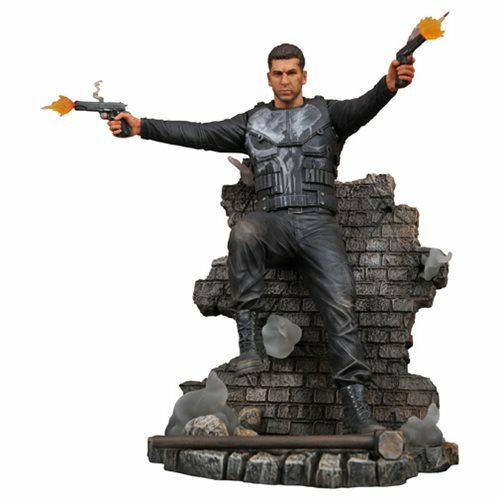 Inspired by the Punisher TV Series on Netflix, this 9-inch tall statue shows Frank Castle crashing backwards through a brick wall as he takes aim at multiple targets. This sculpture features the likeness of actor Jon Bernthal, as well as detailed sculpting and paint applications, and comes packaged in a full-color window box. Sculpted by Rocco Tartamella! Ages 14 and up.